I downloaded the Self-Help Anxiety Management (henceforth, SAM) app to my phone several weeks back with the intention of giving it a trial run. Today I got quite anxious and after knitting part of a scarf, walking three miles, trying to meditate, and taking a nap, all with zero success in stress-reduction, I remembered it. This is Day 1 of the test–I’ll write more well-rounded analysis in 7-10 days, when I’ve used it over time. If you’re interested in testing alongside, this is the iOS link and here’s one for Android. Before: Welp, even more anxious than I realized. Thought 1: Wow, Kate, you are anxious a lot. Thought 2: Wait, this seems to actually be helping quite a bit. -An anxiety tracker (data entry part pictured on left). I paired this with Annoyster (Apple/Android alternative), to pester me to chart anxiety at random intervals throughout the day. Goal: Getting a better picture than either charting when I’m calm enough to remember or charting when I’m anxious enough to open the app. -It indicates that the designers recognize that coping techniques vary widely. What works for me may leave you bored and still anxious. -When the toolbox fills up, I won’t have to sift through all the activities on the main page to find what I want. Also, if I can make going from anxious to trying coping mechanisms quickly, it increases the likelihood that I’ll do that instead of getting wrapped up in a loop of self-defeating thoughts. After: Anxious, but manageably so. Time invested to get to this point: 10 minutes. -A little thing that just made me happy: in one of the calming techniques, guided breathing, you can adjust the inhale/exhale times. Attention to detail like this matters. I breathe quite shallowly, and likely wouldn’t have found the exercise practical without customization. Of course, if the app didn’t allow for this, I could have just done focused breathing exercises on my own….and been much less likely to make it a habit. -It’s not very intuitive. I had to read the directions and fiddle around with buttons for each screen. I strongly recommend playing with the app during a non-anxious time before putting it to use. -There’s some sort of social network aspect where you can set up an account. I have no idea what the value of this is. -All of the references, numbers to call, and resources are for the UK. (The app was developed by a university in Wales. -I’m not sure how all the pieces of the menu fit together. Sure, it’s great that there’s a place for me to list things that make me anxious, and I like having coping techniques, but how can I use them most effectively? Not a lot of advice is offered. 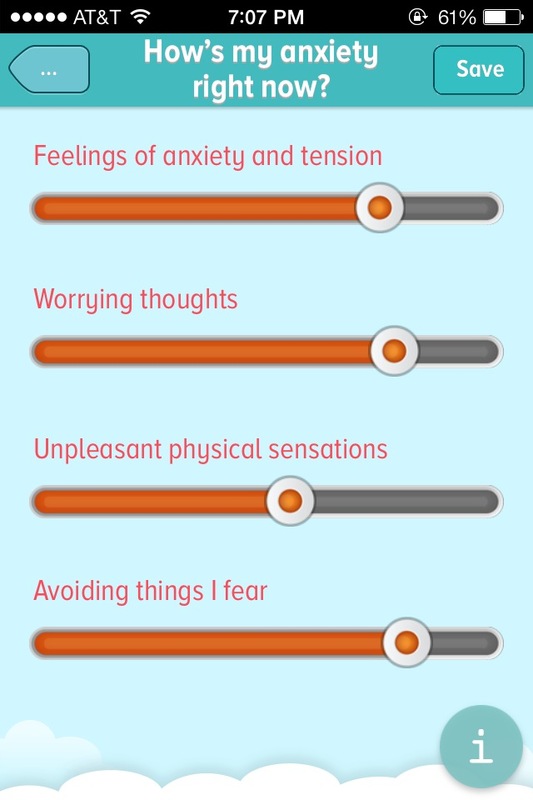 If this was the first app I’d tried or the first attempt I’d made to manage anxiety, I think I might be less enthused. First thoughts: I like this! It’s the first app I’ve recommended to friends, and the first that I’ve seen immediate results from. It’s free, it’s made by people in the field, and worst case, I’ll have more data about my mood over time that I can use. Disclaimer: I’m not a therapist. Definitely consult yours, and SAM and my advice aren’t alternatives to medical care.